This one of Brassens’ most entertaining poems- in spite of the gloomy title. Paul Valéry, a highly respected man of letters of the previous generation, born also in Brassens’ home town of Sète, had written a famous poem called “Le cimetière marin”. Brassens gives an alternative viewpoint to Valéry’s symbolist vision of a seaside graveyard, as he writes with wit, imagination and nostalgia about the more down-to-earth realities of his birthplace and the love, friendship and enjoyment he had found there. Mon caveau de famille, hélas, n'est pas tout neuf. Dire à ces braves gens:"Poussez-vous donc un peu ! Place aux jeunes ! "(8) en quelque sorte. Sauve qui peut ! Le vin et le pastis d'abord ! Je connus la prime amourette..
Diront : "Chouette, un château de sable !" Pauvres rois pharaons ! Pauvre Napoléon ! In a sleeper on "Paris-Méditerranée"
1) Brassens did not intend his petition to be buried on the beach too seriously. He once said he was only having fun with the idea. The tone of the poem verifies it. 3) semé des fleurs –The dictionary says that “semer des fleurs sur la tombe de quelqu’un” means to turn someone’s memory into a cult. Brassens is rightly acknowledging that he goes on quite a lot about death in his songs. It has to be admitted that he did have a morbid streak. “The Grim Reaper”, our personification of death, is depicted with a dead skull with empty sockets for the nose and eyes. In French the personification of death is called La Camarde for this same reason. Camard is an adjective which means pug-nosed, having a flat nose, as if crushed –like the nose of an old-time boxer. 4) cerné de près par les enterrements- "Supplique pour être enterré à la plage de Sète" was written in 1966. In the previous year, Brassens lost his father on the 28th March and Marcel Planche, Jeanne’s husband, died on the 7th May. 5) Gavroche - Mimi Pinson. Gavroche is a cheeky, rebellious young street urchin in the novel, “Les Misérables” by Victor Hugo. Mimi Pinson is a character in a work called “Mimi Pinson, profil de grisette" by the famous French poet, Alfred de Musset. A grisette is a young, sexually easy-going, working class girl. Both of these fictitious characters liked to express themselves in song. With such company Brassens’ soul would be in heaven. 6) Paris-Méditerranée A train for holiday destinations. 7) il est plein comme un œuf – Brassens says the tomb was full as an egg. I had not met this expression in English but on looking it up, I find that it is in use. As I am not certain of the context in which “full as an egg” is used in English, I have substituted the most common image in English for being packed together. 8) Place aux jeunes. Perhaps this incongruous remark in the society of the dead can be interpreted as a disdainful Brassens’ reference to the call made to the older performers with the advent of the teenage pop groups of the 1960s. See “Les Trompettes de la Renommée”. 9) les dauphins – This was the name given to the swimming club at Sète when Brassens was a boy. We can assume that the girl he is to recall in the next verse is also a keen swimmer. 11) The picture of life on a happy, boozy ship, with the odd nautical crisis, is reminiscent of Brassens’ memories of boating with his mates in “Les copains d’abord”. 12) la première arête. There is a pun on “arête » which means fishbone and “Arrête!”, meaning stop. The fishbone is mentioned because the girl is mermaid and thus half fish. The image seems a bit contrived and is certainly impossible to translate. This is my tentative suggestion, but I regret that an explanation needs to replace the teasing puzzle that Brassens had left us with..
13) Chacun sa bonbonne et courage -I have translated this as a play on words. The "bon" in "bonbonne" also goes before "courage". Although the captain may make pretence of being in complete control, when the boat is sinking all he can say in the end is "bon courage" - hope for the best. 14) Paul Valéry (1871-1945) was a famous poet, critic and essayist. “Cimetière Marin” was the title of one of his most famous poems. He was born in Sètes and buried there in the Cimetière St Charles. In the following year, 1946, the dignitaries changed its name to the “Cimetière Marin” in homage to him. 15) “autochtones » These are the important men of the town, who had decreed that Valéry’s graveyard was the “cimetière marin” –whose authority Brassens is undermining! Brassens, the outsider, certainly did not identify with them. 16) Le mistral et la tramontane -These are two winds that blow over the South of France. One seems to come from the West, the other from the East. 17) villanelle and tarantella - sardane and fandango This is the music of song and dance, blown in from opposite directions from Italy and Spain. 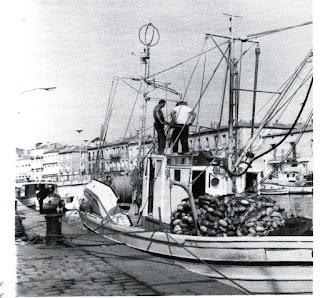 Sète is the largest French fishing port on the Mediterranean , with tunny fishing boats and trawlers harboured there. Behind Sète is a large coastal lagoon called the étang de Thau where shellfish are cultivated. Brassens was not buried on the beach at Sète, but he would not have expected it as he was only joking. He was not buried with the worthy middle class and Paul Valéry in the cimetière Saint Charles, the so-called cimetière marin, but in the cimetière Le Py, from where can be seen the inland sea of l’étang de Thau. This second cemetery of Sète is known as the cimetière des pauvres , but it should not be assumed from this that the highly successful Brassens had a pauper’s funeral. It is reported that there is a pine tree near his grave, but that it had difficulty in establishing itself because of being trampled by the number of people who come to visit his grave. If any holiday maker in a skimpy bikini comes to his grave, the only sensation she is likely to have is a mysterious sharp stabbing feeling. When she died in 1999, Brassens' long-time companion, Joha Heiman, his « Püppchen », was buried at his side in the cemetery at Sète. His song, “Je me suis fait tout petit”, describes how she used her umbrella to ward off any seductress, seeking to offer Brassens the sexual consolation, which she was not prepared to offer him. Midday the exact composes upon it some lights. Than a long look upon the calm of the gods. First line - "La camarde" - translated by "old father time" ??? "La camarde" - as far as I know, is the death, the death that is always crawling through the livings to find a victim. You do a very good job - but why this "old father time" here ??? Excellent job, thank you very much for taking time out to do this ! Thanks very much for your excellent work. I've been a fan of Brassens for a very long time, but one or two of the more obscure references in his songs were beyond me, and it is clear from your notes that some of the songs are allegories which I wasn't aware of. Your notes and explanations have greatly added to my enjoyment of the great man's oeuvre. I just came across your Brassens translations and I am grateful for your effort at making him known in English. Here is a little contribution from a French speaker and amateur poet. If i can contribute, the first word it's "Camargue" means "La Camargue", it's the name of a spécifique area close to Sète around the sea, very humide zone where peoples grow rice and have also a specific horses. (1) I confirm the name is Camarde as translated Death reaper. Brassens used the word a lot in his songs may be as it sounds like Camargue a touristic area close by his honetown he shall have cheer a lot. Thanks all forb your interest to this great singer (bad one by the way) but unique poet and anarchist. We are going to Sète next week and my brother gave me this song to listen to as homework. Thanks so much for the thorough translation which would have taken me most of the vacation week to decode! !